SAILKARMA.COM - Sailing News, Videos and Photos! : Winging it! 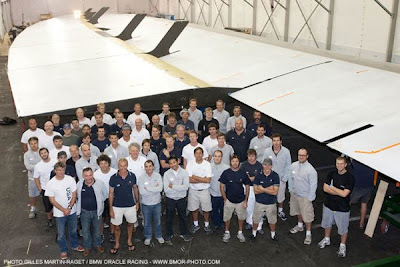 Secret weapon revealed by BMW ORACLE Racing. 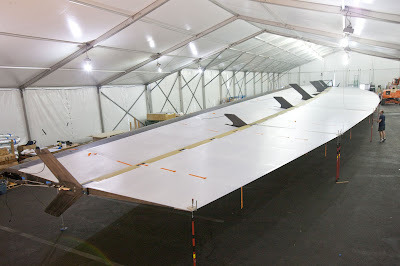 The latest development by the BMW ORACLE Racing team was unveiled today when an enormous wing was prepared to be wheeled out of the tent at the team base in San Diego. A wing of this scale has never been built for a race boat. In terms of size, the wing on BOR 90 dwarfs those on modern aircraft. 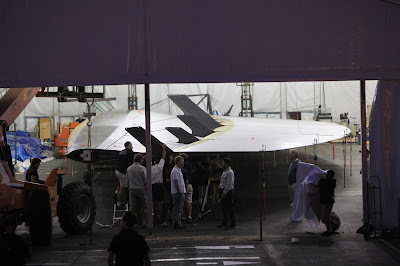 Towering nearly 190 ft (57 m) above the deck, it is 80 percent bigger than a wing on a 747 airplane (102 ft / 31 m).